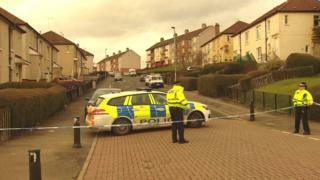 Detectives have released details of a suspect they want to trace after a man was shot as he sat in a van in the Springburn area of Glasgow on Saturday. Police officers were called at about 11:15 after gunshots were heard around Dykemuir Street. A 29-year-old man later attended hospital with injuries caused by a firearm. He remains in hospital and medical staff have described his condition as serious but stable. A police spokesman said it was believed that two men in a red Audi estate car approached the victim, who was the passenger in the van, in Dykemuir Street - at its junction with Craigenbay Street - and shot him. They then made off, heading north along Craigenbay Street. The passenger in the Audi is described as being in his late 30s, clean shaven, and wearing a dark tammy hat and a dark hoodie. There is currently no description of the driver. The incident happened in the same street where a 26-year-old man was shot in March last year. Det Insp Jim Bradley, from Greater Glasgow, CID said: "This targeted attack was carried out in a residential street in broad daylight and the men responsible not only endangered the life of the victim, but other members of the public in the surrounding area. "It is absolutely vital that we trace these abhorrent individuals and we would urge anyone with information that could assist our inquiries to come forward. "If you were in the vicinity of Dykemuir Street yesterday around 11.15am and noticed a red Audi estate, or anything at all suspicious, please get in touch. "We also believe that the vehicle involved may have been in the area in the days prior to the shooting taking place. If you think you may have seen a red Audi estate earlier this week it is important that you let us know." He added: "Additional patrols will be in the area to provide reassurance to members of the public and anyone with information or concerns can approach the officers who will be happy to assist."